Do You Want To Be Motivated? Every person has motivations to do whatever they like. 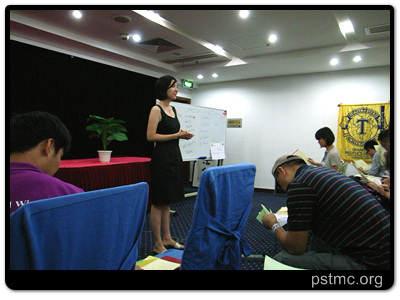 In this evening, what they like was coming to People Square Toastmasters Club! There came a lot of members and guests with different motivations. 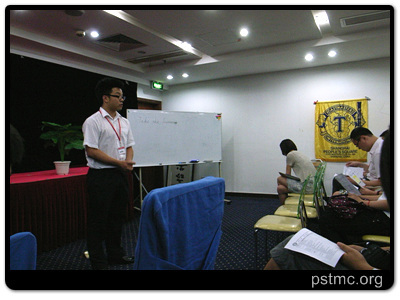 Some were motivated by their passion to listen to different stories, like me; Some came here because they were motivated by their peer, like Ben’s six friends; Some people were motivated by their responsibility as officers to improve the wellbeing of Toastmasters Club in Shanghai region, like our senior guest, Samuel, to name just a few. In “Special Sharing” session, as motivated by his desire to improve the wellbeing of People Square Toastmasters Club, Samuel shared with us his “Standard Operation Process” in global toastmasters club in which he redefined different responsibilities of different role takers and pointed out several aspects that we can do better. The enlightening session has shifted our focus to the front line(speakers) to the backend organizers(officers) and provided us with many tips to better organize our meetings! With his help, we believe we will take a step forward on the way of self-improvement and perfection! Two speakers, with such a sharp contrast in terms of their mode of thinking, style as well as contents delivered C1 and C3 speeches respectively. Oscar, the king of the evening, shared with his male peers quite a few tips on how to chase a girl, how to maintain a positive and stable harmounious relations between each other in a “high” way. His “high” spirit induced laughters everywhere in the meeting room and earned him the best speaker in the evening! While Joy, a very tender lady, lectured on “Pyramid Principle” which I happened to read several month ago. She used “Elevator Test” introducing the “MECE” principle(mutually exclusive, completely exhaustive) which is proposed by McKinsey and widely used in consulting field. We all listened to her tentatively with full contentration and curiosity and after her speech, I have been able to use a more logical way to express myself. “Table Topic” session is always the most popular session as it always attacts a lot of guests to participate. This time was not an exception, too! Six members and guests actively set themselves on the stage and performed a wonderful show! The meeting ended with contentment and pleasure as we not only learned how to deal with relations and how to sell proposal with “MECE” principle, we also attracted two more new members(Oscar Kwun and Megan Peng) to our club by “Law of Attraction”! Let us welcome Oscar Kwun and Megan Peng again and wish them all the best in the club! Let me start with the President Opening. We can see that Joe was well prepared and his energetic words caught our attention immediately, which was very good, because usually people don’t know what to talk about in the first 1 to 2 minutes, just wasting some time on the stage. Joe didn’t talk about any nonsense and all his words were related to the theme of tonight’s meeting, “challenge”! Our timer, Ben Dai was very diligent. He was assigned with the role the last minute before the meeting but he still took it seriously. He also facilitated some speakers very well to control the time by showing them the cards but not disturbing them. Ah counter Sophia Yan also did a very good job. Also assigned with task in the last minute, but from her precise report, we can see she didn’t ignore any minute of the whole meeting. Our Grammarian was very professional and she gave us a wonderful word. One thing I want to mention about is that I also used the word of the day “conquer”, but I didn’t think you count it. Listening is very important. As a leader, you should pay attention to each single word, because no one is happy to be neglected. The table topics session was very exciting. It’s not hard to see that Xiaoxiao prepared those questions very well. As a leader, you must make everything prepared in advance. One thing I want to point out is that a leader is as a boss of a restaurant. No matter what kinds of people coming to your restaurant, all you want to do is to make everything go smoothly. The same theory for Table topic masters, when you’re holding the whole session, you’re responsible for its going smoothly. You should avoid troubles. I’m so surprised by the three individual evaluators. Each of you gave the evaluation according to the objective of the speech, which was well-targeted. A bad example is that when some one is giving an evaluation for a C2 speech, he also talks about body language or vocal variety. I’m happy I didn’t see it tonight. Because as a leader, you should clearly know what your target is and what is most needed, then you can make it achieved. One suggestion to you all is that try not using notes when you’re giving evaluation on the stage! I always leave the best in the last. I like the performance of our TME, Peter, very much. You made everything under control. You used some jokes to connect one part with another. I’m still immersed in your made-up “Brad Peter”! 受到AF俱乐部的邀请,PSTMC与AFTMC合作,在本次会议中呈现了一个爆笑,幽默,讽刺现实,立意深刻的小品.剧中,Edgar Gong, Xiaoxiao Sun, Peter Wan, Joe He, Jessica Yao以及Emma Li都有出色的表现.Joe He与Jessica Yao饰演一对情侣.Jessica Yao背的蛇皮袋上写着两个很大的字:”LV”. 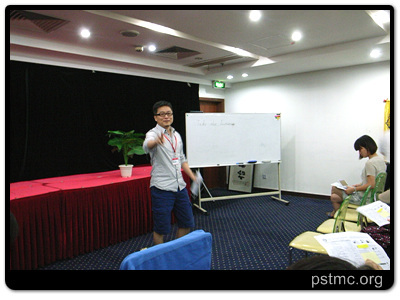 另外,PSTMC的四位辩手Phoebe Chen, Zhang Lin, Kelly Peng, Roawin Law与AF的辩论队的精彩对质让辩论赛高潮迭起,掌声雷动.Phoebe Chan作为一辩,伶牙俐齿,将我方支持观点”年轻人事业起步应该选择外企而不是民营企业”说得头头是道.